we were also anciently known as Sutton in Holderness. from which this old church school takes its name. formerly known as Waghen, and now pronounced 'Worn'. all linked in to a more general Yorkshire and British Social History. This month's stylised background map is of a very complicated area known as "The Groves". Complicated because this used to be the southern extent of St James' parish in Sutton, until 1887, and had been so since medieval times. Complicated because we are almost 3 miles from St James' church down here, a considerable distance, and there were two other districts to the north of this map, Wilmington and Stoneferry, which also fell within this greater area of the original parish. Complicated because few family history resources online mention "The Groves" or where they were. Complicated because explaining 'what it was' and then 'what it became' in Victorian times bears very little resemblance to 'what it is' now. In colouring this map with pastel tints, we'll make an effort in explaining it all. The background here is very faded, deliberately so by design, but the real map is on a link right at the bottom of this article and opens in a new tab in your browser, with tips on how to see it full screen. Notable features and landmarks have been picked out in deeper colour. The lilac shades, to the west of the River Hull, and to the east of Dansom Lane to the right of the map, can be discounted for our purposes. Our area of concern is that pale yellow area in the centre, which stretches right down to Witham, the road we can see with it's tramway picked out in light red and which continues north-east as Holderness Road, now the A165 to Bridlington if you're comparing with a modern map. Running north from the bottom of the map, in light brown or fawn, is Cleveland Street, and to the east, another waterway picked out like the river in light blue is a major drain, the Foredyke Stream. The deep purple factory area is "The Blue Works," or "The Starch Works" as they sometimes appear on the census sheets, which all locals would recognise as Reckitt's & Sons in the day, famous manufacturers of laundry products for bleaching and whitening shirts, collars, slips, underwear and bed linen - in the main. The former Dansom Lane recreation ground is shown in light green, where the stump of an old flour mill, as well as the rusting boiler and wheels of an ancient steam engine, could be seen until well into the 1970s on the children's playground. The 'new' church of St Mark's, which gave the area its name, and the consecration of which saw the start of the break up and contraction of Sutton's parish, is clearly marked in red. The associated church schools are just behind. A little to the east is the gas works, the gas holders delineated here in blue. The full title of the area became "St Mark's in The Groves", a sort of acknowledging nod to the fact that The Groves was a named area long before. It took its name from being a very wet area, of marsh and reedy 'growths', which flooded constantly and especially in winter, until the River Hull was more or less tamed with higher banks and the land could be dried out enough to build residential areas on it. I say 'more or less' - for the river still used to overflow at North Bridge on high spring tides right up to the 1950s and flood all down Witham and into the basement flats of all the old Victorian houses down there long before it became the street of car showrooms and warehouses it is today. Increasing industrialisation along the River Hull, with ever more mills of various types, both flour and seed crushing, would see the need for new housing, and the two developed hand in hand in the last two or three decades of the 19th century. Indeed, the very building of those mills also helped to raise the river bank and control the seasonal flooding to a great extent, and so the area dried out enough to build more terraced streets. This map is dated 1910, by which time all the free areas that could be built upon were. And indeed, they were built upon in what we might call now, close harmony. Densely packed housing, back-to-back, tiny terraces with communal yards and lavatories, and one fresh water tap serving several properties in those very early ones. The terraces, dozens of them, look like little side streets off the main street on the map, and for pedestrians they were. Just narrow footpaths, too small to get a horse and cart along, each house perhaps with a very tiny 'front garden' bounded by a low brick wall of two or three courses topped by iron railings - if they were lucky. Hull folk know exactly what was meant by a 'terrace', and it has a greatly different meaning to the same term used in other cities. Along with the regular flooding and nearby stench of industry, these dwellings were unfit for human habitation and obsolete before their roof tiles were put on! 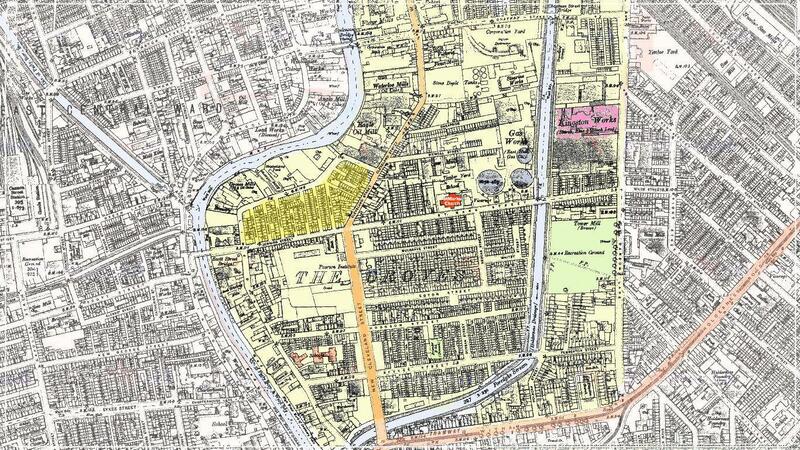 The area coloured in an even deeper yellow is worthy of note. 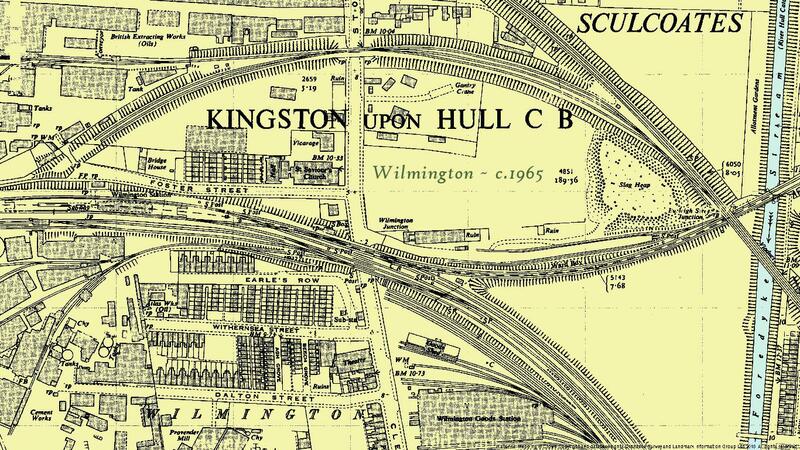 Still "The Groves", this was Lime Street and included the little streets that led off at the northern end. Lime Street was previously a very wet and muddy lane, that predated the 'new Cleveland Street', and was the original track that led north roughly following the course of the river to Stoneferry. Up to the time of Queen Victoria's coronation, that was the way to walk to Sutton - if it was passable - and it is worth noting that when a walker did arrive in Stoneferry at 'The Green', he was only halfway to Sutton village. Such was the size of this huge parish. Those little streets were named after famous English admirals, so we have Nelson, Duncan, Jarvis, Howe, Sidney and Hood Streets. All gone now, all buried under factories and yards as if they never were. There were a few houses in Lime Street itself, short stretches of terrace of a few houses, and these crop up on the census sheets leaving folks puzzled as to exactly where they were. There were enough families here to warrant a school, also marked in a deeper colour. This is the school at which Lt. Jack (John) Harrison VC MC taught as a young man, attending teaching college in York, and whose memorial Victoria Cross centenial paving plaque we now host in the war memorial garden in Sutton. The map is so densely packed with detail it is all but unreadable, (there's a link below to a clearer copy for your perusal) which in some way is appropriate in that the dwellings were likewise so packed together it is hard to see how folks lived in them, brought up families, some of which went on to do quite well in the world. There was great poverty here, terrible deprivation, and yet children went to school and thrived and went out into the world of work and raised their own families. A lot of Hull folk today, now well into their 70s, 80s and more, as well as many dispersed around the world, can still remember growing up in these areas until many were demolised in the 1950s. Most were gone by the 60s, and all just about all gone by the 1970s with the exception of about three streets which still have long rows of terraced housing interspersed with industrial and business premises, now improved with all mod cons and almost unrecognisable to when they were built. The church of St Mark's, here marked in red, locates the street that takes its name, St Mark's Street, running roughly east to west across the middle of the map. The extension to the west, leading to a bridge over the River Hull, is Jenning Street, names that are just about readable. For strangers to Hull, as a guide to the other street names, below that, in order, we have Musgrave, Egton, Hodgson and Spyvee Streets. To the north of St Mark's, we have Sitwell Street, and Cheapside, and right at the top running to another bridge over the river is Chapman Street. Near the bottom, as a continuation of Spyvee Street, there is Pemberton Street, running through to Dansom Lane, that being the eastern boundary of the ancient Sutton parish here. There are several other little streets, unreadable here, but Whitby, Redcar and Holborn Streets come to mind. Several old timers, only a decade older than me, can recall strapping oil barrels and wooden planks together and rafting, and swimming and fishing, in the deep and putrid industrialised waters of the Foredyke Stream that ran behind many terraces. I doubt if many fish could be caught, but the waters were deadly to any young boy who fell in who was short on swimming skills. Indeed, there was one long terrace of houses that fronted onto the stream itself, off Pemberton Street. Some stream! It was nothing less than a deep and deadly drainage dyke, and deadly not just on account of the depth of water - it was certainly no 'stream'. The level of the stream dropped twice daily with the outgoing tide, leaving sloping banks of glutinous mud, imbibed with animal filth from the streets as well as chemical and industrial waste and the by-products of fertiliser manufactured from fish meal amongst other things. These narrow and cramped former areas have been much in my mind of late, as I plough through our now final list of the 224 men of this area, soldiers and some sailors of The Great War. Men whose names never made it onto their own war memorials. Or those that did have long since disappeared with the ravages of time. This is the list compiled over five years of diligent research by Terry Keal, former city councillor for the Sutton ward, and now finalised to a fixed number of names which have now been added to our war memorial in Sutton. And now you will realise the reason for the added poppies on this background map. It is highly appropriate that the engraving work for all the names, including these 224 extra men, has been done by a local stonemason company, Oddlings of Hull, in their yard on Cleveland Street, right in the very heart of this area that witnessed so much tragedy and so many tears. I swear that, as I research more and more, I realise that the tears shed here alone, over a period of four or five years, could verily have filled that Foredyke Stream all by themselves. These areas, St Mark's, Wilmington and Stoneferry, did have their own cast iron war memorial plaques affixed to their own church walls. When those churches were demolished as part of the slum clearances, starting with St Mark's in the late 1950s (badly damaged in the Blitz in the Second War anyway), their plaques were first stored away in council vaults, then it was decided to take them to Sutton, as this was their former parish going back to medieval times. There was thought to be nowhere else suitable for them, but as it turns out, the choice was very appropriate and more than fitting. What do you do with carefully cast iron wall plaques containing the names of dozens of dead soldiers and sailors, other than to return them to their roots, the original place of worship where many of their parents and grandparents were married or baptised. The original intention was to add the names of both those plaques - some 146 in total - to the new granite scrolls recently fitted in 2014 at Sutton in time for the 1918 Centenary. All went awry when research found as many again and more - 224 - that also need to be added if we are going to be just and fair, and to keep that promise made a century ago - 'Their Names Will Liveth For Ever More". In perpetuity, the Commonwealth War Graves Commission says, and so do we. Men that were missed off for a variety of reasons, much of which is explained elsewhere on these pages, but which we now intend to honour along with their neighbours and comrades, many of who were brothers, sons and many, many cousins. A full century is a long while to take to put the record straight, and was not possible before the wonders of the internet. But that is exactly what we intend to do, and only right that we do so. It is heartbreaking to wade through these lists and record sometimes two or three dozen men from the same street who were never honoured for their contribution, for their lives. It is incredible that so many men could be lost from such a small but densely populated area, and even more so that so many could be simply forgotten and ignored. From Witham in the south, to Stoneferry a mile or so up Cleveland Street, and all the terraced streets in between, there are 370 such men in total - including the ones we always knew about. But our area was not unique in the respect of huge losses, most of the terraced streets of East Hull suffered likewise - I recall seeing a record of some 50 men just from Mersey Street, and other Hull streets fared just as bad ~ some worse! Some 7,500 Hull men from all over the city are recorded as having lost their lives in that four-year period, which puts our local numbers into a meaningful context. When the peace came in 1918, just 100 years ago, the 'victory' must have seemed a very hollow one to the surviving parents, wives and children of the men who never came back. The area must have reeked death and loss and tremendous heartbreak such as just cannot be imagined now. Yes, there was the Blitz that came later, and these areas were heavily hit, by the way, with more visitations of tragedy, and yet more military losses of the Second War, but it was nothing on the scale of the appropriately titled 'Great War'. Great was the destruction, and killing, and in areas like this Great was the Grief and huge poverty and desolation that followed in the wake of so many able and working men being taken from their homes in the space of just three or four years never to return. Whether they were volunteers who wanted to help to put the bullying Kaiser back in his box, or reluctant conscripts who had no enthusiasm to fight, it's all of no consequence by the time of the armistice. War is war, and dead is dead, no matter the means or reasons of one's passing. In tightly knit areas like this, in cities all over the kingdom, the grief was all the same. Of those that did return, many were injured enough never to be able to find meaningful work again, or were so badly damaged in their minds they ultimately took their own lives. A good many died before the next decade was out, of lung or bodily complications as a result their service to their king and country in the cause of freedom, and were never formally recognised as war casualties, which undoubtedly they were. The war supposedly finished in 1918, but the suffering went on a lot longer than that, and communities such as this were still reeling from the effects of war when, barely 21 years later . . . it all happened again. Against the same enemy, and for much the same reasons. When would it all end, they must have cried. Some of the sons of the men who had died in the Great War would go on to lose their lives in the Second. The very last of the widows of the Great War, many of which would never marry again, have only just died themselves in the past couple of years or so. Like the last soldier, the girls have all gone too. And so the repercussions of those great conflicts are with us still, seemingly never ending. As complicated as it is, as hard to read as this poor map is, I hope this explains a little more about 'The Groves', especially to those not familiar with Hull, but have perhaps this one tenuous link in their family tree of a family who once lived here, and suffered as these people did in a way we cannot comprehend now. But we try. and a better map, click HERE. To view this map in higher definition, click the graphic below, press F11 to hide any toolbars, it will appear in glorious Full Screen. If you can see the faint white border all round, you have the full map. The original map is from www.old-maps.co.uk, and can be seen for free at their site. It's a bit of a twiddle to get them full screen, even to get the map you really want, but trust me, if you love maps, it's worth it. There's some more guidance below. [ Press F11 again to get your toolbars back unharmed. in the writing of this discourse on The Groves]. This Background Map . . . . . . . . . . . . . . . and another map to enjoy! also came from the area to the north, in between The Groves and Stoneferry, known as Wilmington. back-to-back concentrated grief when the tragedies of WW1 struck. We remember them all. even more so if you select to just view this frame, and lose the side menu. This website, and all its associated pages, is brought to you by the Sutton & Wawne Museum, a Free Museum inside the Old School, Sutton on Hull.